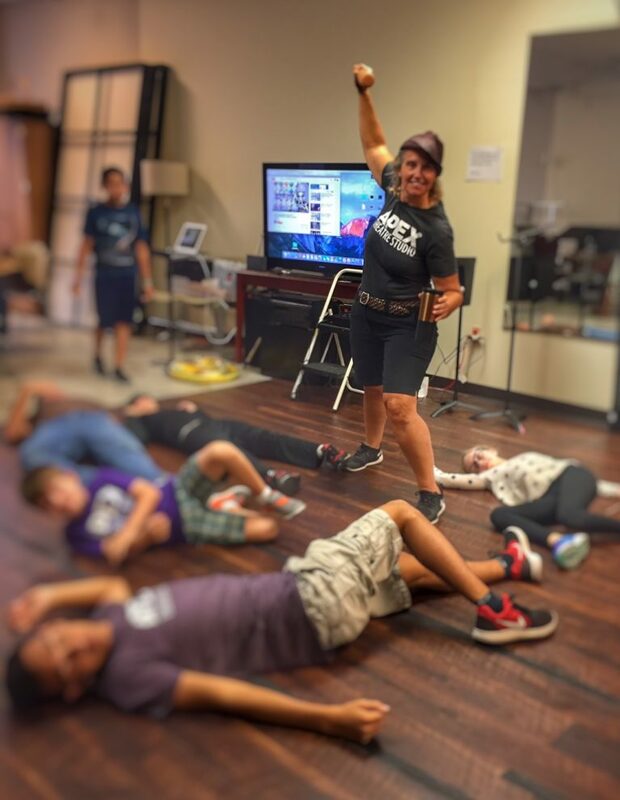 Last week I spent time at Apex Theatre Studio assisting with their summer camp week dedicated to Superheroes, comic and staged combat. I have the fun role of Occupational Superhero Consultant. What is that you ask? The idea of this week’s camp is to allow young campers through the art of comic book story telling, specifically the super hero, and staged combat young campers can problem solve scenarios their characters may get involved in. It is my position to assist the campers in their task. Asking questions about their creations is very important. (what is their super power, side kick, origin story, etc) The campers can then decide for themselves what would work and what would not for their superhero. This allows the camper free reign to use their imagination and problem solving skills to develop their super hero. Having knowledge and enthusiasm for comics and pop culture is one thing but, so is having a deeper academic foundation in the genre of comic books and Super heroes. Prepping for the week was paramount. Watching a series of the latest super hero comics is certainly fun and one way of connecting with the campers, (It is usually the campers’s first experience with a super hero) but it is not enough. If you are new to deep research, the internet has excelled over the years in creating a vast depository of academic papers in topics that can be staggering to the mind. In the area of comic books and Super heroes, I found academics have been writing very important research and critical essay papers over the years. It certainly can be difficult to hunt down academic papers with a mere cursory search on the basic internet search engine. The essays and papers I found cover a vast number of topics such as the importance of learning to read through comics and the mythology of the American Superhero. These are but a mere fraction of the topics found in this field of study. For my prepping task, I utilized the academic databases Gale’s Academic OneFile, found through the Jacksonville Public Library, JSTOR and Google Scholar. Basic search engines are great for simple searches but the three I used have access to papers and articles that may not show up in a simple search. By using these sites, I was be able to enhance my knowledge on the topic and pass on this knowledge to my campers. The sites are easy to use, performing a search is easy enough. You can access and view the abstract or synopsis, making the decision of needing to download a particular article as a pdf. Most sites willl allow you to open the article on your desktop, Apple’s iPad or other tablet reader. What I love is that the researched academic papers I found on these sites are loaded with citations listed at the end of the articles. This is certainly a great way to delve even deeper into any topic. One exciting find was by Wonder Woman creator, William Moultan Marston. William Marston a psychologists was hired by then Detective Comics, later to be become DC Comics. His 1943 article, “Why 100,000,000 Americans Read Comics”1 Marston discusses the importance of reading comics, comics where 40% of the readers are adults. Adults reading comics in the 1940s! Who knew? This paper was important because people were discussing the influence comic books and the superhero had on popular culture at the time. William Marston arguments points to ideas in comics that are still relevant and pertinent to our own current pop culture interest in superheroes today. Performing this kind of research and preparation, I was able to enhance the camp experience for the young superheroes. Using deep research databases is one way to help my clients with other topics needing investigation. On this Wikipedia link is the page of many academic research databases available for the public. The page entry is very helpful because of the details of denoting which is a free database and which is a subscription as well as the topics the databases cover. The Gale AcademicOne is free to Jacksonville Public Library users. I utilize JSTOR on a regular basis, therefore I secured a subscription via a private library, which Spazhouse, Intuitive Research belongs to. In later articles I will highlight some of the other searchable databases I have used for other projects.